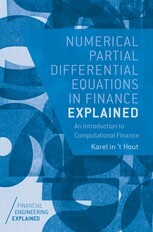 Numerical Partial Differential Equations in Finance Explained. The new book by Karel in’t Hout has now been published. I will take the opportunity to interview Karel, who has in fact been working in the area of numerical PDEs in finance for many years. Karel in’t Hout (University of Antwerp) will be organizing a Symposium on Computational Finance as part of the MathFinance Conference (16-17 April 2018) in Frankfurt. Join the conference to get your personal copy signed by the author. Uwe: Karel, first of all congratulations to complete your book. How many years did it take you to write it? Karel: Thank you very much Uwe. I started with writing the book in the summer of 2014 and the text was completed in July 2016. The writing was done mostly during evenings, weekends and holidays. The writing process has been somewhat irregular, depending on my various duties as associate professor at the University of Antwerp. A main part of the writing time has been devoted to the underlying Matlab codes, which support the many examples that illustrate the numerical methods discussed in the book. Uwe: How did you ever get into numerical PDEs? Karel: My original research area, at the time of my PhD position in Leiden and my postdoc period thereafter, was the development and analysis of numerical methods for delay differential equations. Such equations arise notably in the field of mathematical biology. At this time, I had also become familiar with numerical methods for time-dependent partial differential equations, and had written a paper about operator splitting methods. Then, in 2002, I made a career switch and took up a position as quantitative researcher at ABN AMRO Bank in Amsterdam. There I quickly learned about the prominent role that PDEs play in financial option valuation and the new, interesting features they possessed as compared to their applications in other fields of science. I returned to the academic world, first in the US, and began to perform structural research in this direction, in particular on operator splitting methods. I have been continuing and enjoying this research ever since. Uwe: What fascinates you about the subject? Karel: The large variety of challenging mathematical problems in finance and the desire to develop and analyze efficient, stable and robust numerical solution methods for them is what drives me most. As already briefly alluded to, the PDEs in finance possess a broad variety of interesting features. For example, the multi-dimensionality and the presence of mixed derivative terms, non-smooth initial data and degeneracy at the boundaries. In addition, many captivating generalizations of PDEs arise in finance, such as partial integro-differential equations and partial differential complementarity problems. It is exciting to design, and rigorously analyze, effective numerical methods for these problems. Furthermore, there is much interest from the financial industry in the latest developments about numerical techniques for these problems, which is very stimulating. Uwe: Knowing the careers in academia, writing books is – like teaching – often an activity that doesn’t count compared to writing papers in highly ranked journals. What motivated you to do it anyway? Karel: Indeed, even though I much enjoyed the idea of it, I was in doubt whether or not to write a book. Wim Schoutens, the editor of the Financial Engineering Explained series in which the book has appeared, convinced me however of the interest there would be in an easily accessible, practical text explaining numerical methods for PDEs in finance. I am grateful to him for inviting me. In spite of the time it has taken, it has been a great pleasure and a rewarding experience to write this book, in a different way than writing journal papers is. Now that the book has launched, I much hope that students and practitioners will find it a valuable and attractive source to learn about the topic. Uwe: Do you get any feedback from the financial industry about the relevance and applications of numerical methods for PDEs? Karel: Numerical methods for PDEs are employed by the larger financial institutions and companies who find it a very effective and robust approach for many of their valuation and hedging problems. We aim to stay up-to-date with their demands, in particular through workshops and conferences, such as the MathFinance Conference, which I am much looking forward to every year. I believe that at present the numerical solution of PDEs is still being regarded by the financial industry as more advanced than the familiar Monte Carlo simulation approach. When going beyond a standard Monte Carlo implementation, however, one also needs to apply more sophisticated techniques, to speed-up the convergence, for example, or to adapt them to American-style options. I hope that the present book will make the important, useful approach via numerical PDEs more accessible for a wider audience. Uwe: Will you tell our readers a secret? You explain the theta-schemes in your new book, using the implicit Euler scheme (theta=1) and a scheme known as the Crank-Nicolson scheme (theta=0.5). In your various conference talks you also cover other schemes. Which one is your favorite and works best? Or at least which methods should practitioners shelf from time zero? Karel: In our research we deal with multi-dimensional problems. For the effective numerical solution of these we investigate operator splitting methods, which can be much faster than the classical theta-schemes, while retaining favorable stability and convergence properties. They are already successfully being used by large banks and financial companies. As you noted, this is indeed often part of my conference lectures. Examples of operator splitting methods are implicit-explicit (IMEX) schemes and Alternating Direction Implicit (ADI) schemes. They are introduced in the final two Chapters 12 and 13 of my book. My favorite scheme is the Modified Craig-Sneyd (MCS) scheme, which Bruno Welfert from Arizona State University and myself introduced in 2007 and has since proved to be a highly efficient and robust numerical method for a wide variety of option valuation problems in finance. For more details on the MCS scheme, the readership of the MathFinance Newsletter is very welcome to contact me. Uwe: What else can students and practitioners do to learn more about numerical PDEs from you? Karel: At the University of Antwerp we run a two-year master program in Financial and Applied Mathematics. In this program I instruct two regular courses myself. These are devoted to the numerical solution of one- and two-dimensional PDEs in finance, including a detailed discussion of methods such as the theta-schemes and ADI schemes. During the courses, the students also gain experience with the actual implementation of these methods, for instance for valuing options under the well-known Heston model. Although the official language of instruction of the courses is Dutch, I also gladly offer them in English. Uwe: The book as slightly more than 100 pages, so a really helpful volume to get into the subject with a limited investment of time. Are you planning a second volume? Karel: Indeed, the present book has been intended as a concise introduction and, as such, I have left out many interesting and contemporary topics. I do have ample ideas for a second volume. Given my many other academic pursuits, however, I am currently not actively planning a second volume. But perhaps in a few years from now. Uwe: How many dimensions do you cover in the book and how many dimensions can you generally use practically? Karel: In the book we cover one- and two-dimensional problems. Studying numerical methods for such problems provides much insight into their key aspects that are relevant also to higher-dimensional problems. By the operator splitting approach, we have successfully solved financial PDEs up to and including spatial dimension four. Beyond this dimension, the well-known curse of dimensionality sets in. In our current research we are exploring ideas however with the aim to eventually tackle also such problems. Uwe: What are the real advantages of numerical PDEs in finance, compared to other methods such as Monte Carlo simulations, especially these days, where computational power has gone up substantially? Is it still worth learning about PDEs? In fact, I have seen top tier banks screening the market for PDE experts from other fields to add them to their financial engineering teams. Can you confirm this? Karel: Indeed, candidates with expertise in PDEs and their numerical solution are highly valued by the financial industry. My most recent PhD graduates have also been quickly hired by renowned financial institutions. The numerical PDE approach is highly versatile and flexible. It can readily deal with complex financial products, for instance options involving early exercise features, and with advanced asset pricing processes, such as stochastic local volatility models. Highly effective and robust numerical methods are now available for many financial PDE problems, combined with a rigorous theory about their fundamental properties such as stability and convergence. Also, the approximation of the Greeks is relatively easy with PDEs. Uwe: How does the calculation of Greeks work with PDEs compared with other methods? Do you cover this in your book? Karel: Yes, this is indeed also covered by the book. As it turns out, the important Greeks delta and gamma essentially come for free as they are intrinsic to the PDE formulation. Other Greeks can be accurately computed by solving a PDE additional to the one for the option value. The details of this are explained in Chapter 6 of the book. When many different Greeks need to be computed, the adjoint method can be employed. The latter, interesting topic is something we would like to pursue further in our future research as well. Uwe: Other than derivatives valuation and Greeks, which other areas in finance use numerical PDEs? Karel: There are various other application areas of PDEs in finance. An emergent area is financial risk management for computing quantities such as credit valuation adjustment (CVA) and expected shortfall (ES). Another important application area stems from optimal stochastic control problems, for instance optimal asset allocation for long-term investments such as by pension funds, which leads to Hamilton-Jacobi-Bellman equations. Uwe: Many thanks, Karel, for your passion and mission, best wishes for your upcoming research projects. I am looking forward to reading more. Karel: Thank you very much, Uwe, for having me for this interview, it has been a pleasure. My best wishes, and much looking forward to the upcoming MathFinance Conference in Frankfurt. as well as academics in financial mathematics or general finance. How Accurately Did Markets Predict the GBP/USD Exchange Rate around the Brexit Referendum? to name a few. Check our conference website for a detailed topic and speaker list. World-renowned speakers, such as William McGhee (Global Head of Quantitative Analytics, NatWest), Artur Sepp (Quantitative Strategist, Julius Bär), Jürgen Hakala (Managing Director, Leonteq), Jessica James (Managing Director Senior Quant Researcher, Commerzbank), Adil Reghaï (Head of Quant Research Equities & Commodities, Natixis) and many others will present their topics on 16th and 17th April in Frankfurt. For a full list of speakers, check here. All talks end with a Q&A sessions to encourage the participants to dive into the topic of the presenter. There are also plenty of breaks featuring book-signing sessions with Karel In’t Hout (Numerical Partial Differential Equations in Finance Explained) and Uwe Wystup (FX Options & Structured Products, 2nd Edition). After this, soak in the atmosphere and network at the cocktail reception and the following Conference dinner on 16th April. a must for all in the financial industry business!